Background and objectives Thrombotic microangiopathies constitute a diagnostic and therapeutic challenge. Secondary thrombotic microangiopathies are less characterized than primary thrombotic microangiopathies (thrombotic thrombocytopenic purpura and atypical hemolytic and uremic syndrome). The relative frequencies and outcomes of secondary and primary thrombotic microangiopathies are unknown. Design, setting, participants, & measurements We conducted a retrospective study in a four-hospital institution in 564 consecutive patients with adjudicated thrombotic microangiopathies during the 2009–2016 period. We estimated the incidence of primary and secondary thrombotic microangiopathies, thrombotic microangiopathy causes, and major outcomes during hospitalization (death, dialysis, major cardiovascular events [acute coronary syndrome and/or acute heart failure], and neurologic complications [stroke, cognitive impairment, or epilepsy]). Results We identified primary thrombotic microangiopathies in 33 of 564 patients (6%; thrombotic thrombocytopenic purpura: 18 of 564 [3%]; atypical hemolytic and uremic syndrome: 18 of 564 [3%]). Secondary thrombotic microangiopathies were found in 531 of 564 patients (94%). A cause was identified in 500 of 564 (94%): pregnancy (35%; 11 of 1000 pregnancies), malignancies (19%), infections (33%), drugs (26%), transplantations (17%), autoimmune diseases (9%), shiga toxin due to Escherichia coli (6%), and malignant hypertension (4%). In the 31 of 531 patients (6%) with other secondary thrombotic microangiopathies, 23% of patients had sickle cell disease, 10% had glucose-6-phosphate dehydrogenase deficiency, and 44% had folate deficiency. Multiple causes of thrombotic microangiopathies were more frequent in secondary than primary thrombotic microangiopathies (57% versus 19%; P<0.001), and they were mostly infections, drugs, transplantation, and malignancies. Significant differences in clinical and biologic differences were observed among thrombotic microangiopathy causes. During the hospitalization, 84 of 564 patients (15%) were treated with dialysis, 64 of 564 patients (11%) experienced major cardiovascular events, and 25 of 564 patients (4%) had neurologic complications; 58 of 564 patients (10%) died, but the rates of complications and death varied widely by the cause of thrombotic microangiopathies. Conclusions Secondary thrombotic microangiopathies represent the majority of thrombotic microangiopathies. Multiple thrombotic microangiopathies causes are present in one half of secondary thrombotic microangiopathies. The risks of dialysis, neurologic and cardiac complications, and death vary by the cause of thrombotic microangiopathies. Thrombotic microangiopathies (TMAs) represent a diagnostic and therapeutic challenge for clinicians (1–3). TMAs can be classified as primary TMAs in patients with thrombotic thrombocytopenic purpura (TTP; associated with reduced activity of ADAMTS13 [a Disintegrin and Metalloproteinase with ThromboSpondin-1 motifs, 13th member]) or atypical hemolytic and uremic syndrome (aHUS; mostly caused by complement alternative pathway abnormalities) (3). The other patients with TMAs are classified as having secondary TMAs, and classic causes include TMAs associated with shiga toxin due to Escherichia coli, pregnancy-related TMAs (mostly due to preeclampsia; hemolysis, elevated liver enzymes, and low platelet count [HELLP]; and severe delivery bleeding), hemolytic and uremic syndrome (HUS) associated with infections not related to E. coli shiga toxin, transplantations, malignancies, autoimmune diseases, drugs, and malignant hypertension (1–3). In some patients with secondary TMAs, none of these causes are identified, and the mechanisms of these TMAs are unclear. Many questions remain regarding TMAs. First, the relative contribution of secondary TMAs compared with primary TMAs is presently unknown (3,4). Second, how patients with primary and secondary TMAs are managed in clinical routine is unclear (4). Third, the distinction between the main causes and the precipitating factors can be blurred, especially in secondary TMAs: in some patients, multiple causes of TMAs may coexist (5–8). Fourth, the relative prognosis of TMA in patients with primary and secondary TMAs is not clear. The goal of this study was to estimate the incidence, relative contribution, management, and prognosis of consecutive patients with adjudicated primary and secondary TMAs. Patients hospitalized in our four-hospital institution (Centre Hospitalier Universitaire [CHU] Tours, Tours, France) between January 1, 2009 and December 31, 2016 who were suspected of having a first episode of TMA were included. CHU Tours includes four hospitals of the Centre area of France. Approval of the ethics committee of our institution was obtained (“Espace de Réflexion Ethique Région Centre”: research project no. 2017–003). Two modes of screening were used (Figure 1): (1) presence of specific keywords in hospitalization discharge summaries (Castor software version 3.0; “thrombotic microangiopathy,” “thrombotic thrombocytopenic purpura,” “hemolytic uremic syndrome,” “schistocytosis,” “ADAMTS13,” “decreased haptoglobin,” “malignant hypertension,” and “HELLP”) and/or (2) presence of a schistocytosis ≥0.5% on a blood smear (DxLab software version 4.23.18). The diagnosis of TMA was suspected in patients with at least three of the following parameters: hemoglobin <120 g/L, increased lactate dehydrogenase (LDH), decreased haptoglobin, schistocytosis ≥0.5%, and platelet count <150,000/μl. All patients’ files were analyzed individually by four physicians (G.B., F.v.T., B.T., and A.B.) using all available data, including hospitalization discharge summaries and the computerized database. Flowchart. Two modes of screening were used (schistocytosis ≥0.5% and/or specific keywords in hospitalization discharge summaries). All patients’ files were analyzed individually by four physicians, and cases of patients with thrombotic microangiopathy (TMA) were adjudicated by three experienced physicians. HDS, hospital discharge summary. Patients were then adjudicated by three physicians (C.V., F.F., and J.-M.H.) familiar with the management of TMA and practicing in Competence Centers as well as members of the French Reference Center for Thrombotic Microangiopathies (Figure 1). The first step of the adjudication was to rule in or rule out the diagnosis of TMA. The second step was to identify the cause of TMA using a strict hierarchical process. First, we looked for the presence of ADAMTS13 activity ≤10% for the diagnosis of TTP. In the absence of TTP, diagnosis of HUS due to E. coli shiga toxin was considered in the presence of shiga toxin–producing E. coli using stool cultures and/or PCR. Second, pregnancy-related TMA was suspected in patients with HELLP, preeclampsia, or severe delivery bleeding. The same hierarchical process was applied for other causes of TMA: drugs known to be associated with TMAs (4), transplantations, other infections with no evidence of E. coli shiga toxin (referred as “infections”), cancers, autoimmune disease, and severe/malignant hypertension (hypertensive retinopathy and usually, diastolic arterial pressure>120 mm Hg). In patients with TMA and kidney failure but none of the above-mentioned TMA causes, aHUS was suspected. When patients with primary TMAs presented with other potential causes of TMAs (for instance, infections or cancer), these conditions were considered as triggers (the TMA cause remained primary TMA). In patients with secondary TMAs, we reported all potential causes when several causes or precipitating factors coexisted (1–3). In some patients, none of the above-mentioned secondary TMA causes were found: we described their clinical and biochemical presentation (“other secondary TMAs” group). Of note, a thorough diagnosis workup was not available for all patients (as expected in real-life conditions) managed by frontline physicians. Biologic and clinical data at presentation were recorded. AKI was defined using the Kidney Disease Improving Global Outcomes criteria (9). Only serum creatinine criteria were used to diagnose AKI. The development of major cardiovascular events (i.e., acute coronary syndrome on the basis of elevation of ST segment and troponin I levels or acute heart failure on the basis of clinical, chest radiography, and/or echocardiography findings), neurologic complications (stroke defined in patients as focal neurologic abnormalities associated with ischemic or hemorrhagic tissue lesions found on computed tomography scan and/or magnetic resonance imaging or cognitive impairment and/or epilepsy), or death during hospitalization was recorded using manual chart reviews. Quantitative data are presented as medians and interquartile ranges. Categorical data are presented using percentages. Incidence rates of TMA causes were calculated with the assumption that all patients with TMA were admitted to our four-hospital institution (area population estimate: 1 million; number of pregnancies: 18,000 during the 2009–2016 period). Comparisons were made using chi-squared or Fisher exact tests for qualitative data and Wilcoxon tests for quantitative data. Multivariable logistic regressions were used to assess the association between TMA causes and the development of major cardiovascular events, dialysis, neurologic sequela, and death during hospitalization. For each type of TMA, the model compared outcomes for participants with that type of TMA (including participants with multiple types of TMAs if the TMA of interest was one of them) with those of all participants without that type of TMA. SAS software version 9.3 was used. We identified 1653 patients during the 2009–2016 period. The files of these 1653 patients were analyzed individually (Figure 1). After exclusion of patients (duplicates, missing data, an errors regarding date of admission or hospital), 1380 of 1653 patients (83%) were selected (Figure 1). After exclusion of 81 patients (6%) with TMA before 2009, 1299 of 1380 patients (94%) were adjudicated. The diagnosis of TMA was accepted in 564 of 1299 patients (43%) (Figure 1). Patients with TMA were admitted to 19 different medical and surgical departments (Supplemental Figure 1). Overall, 352 patients (62%) were admitted to intensive care units during their hospitalization. Patients had typical biologic presentation of TMA (anemia, thrombocytopenia, low haptoglobin, and high LDH in virtually all patients) (Table 1). 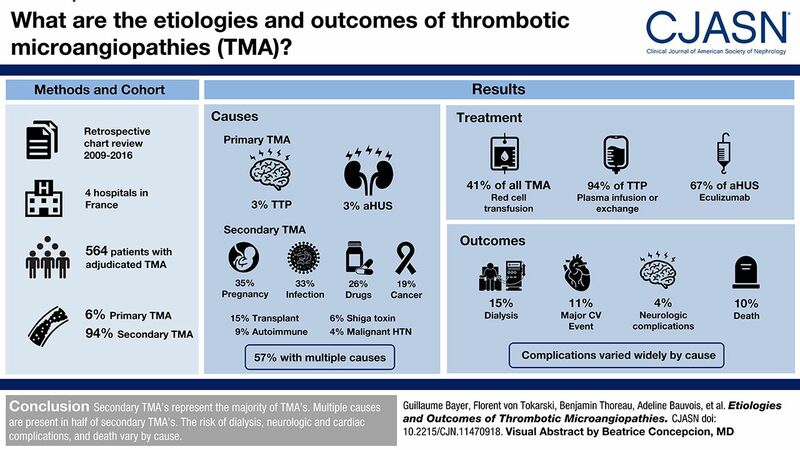 Significant clinical and biologic differences were observed among TMA causes (Table 1). Diarrhea was present in many patients regardless of the cause of TMAs (Table 1). The lowest hemoglobin levels were found in TTP or HUS due to E. coli shiga toxin (Table 1). Platelet count was lower in TTP than in most other causes (Table 1). Serum creatinine levels were more frequently elevated in patients with aHUS, HUS due to E. coli shiga toxin, malignant hypertension, autoimmune disease, transplantation, or infections than in the other patients (Table 1). Primary TMAs were identified in 33 of 564 patients (6%) (Supplemental Figure 2). TTP was identified in 18 of 564 patients (3%; estimated incidence: 2.3 new patients per 1 million inhabitants per year). ADAMTS13 activity was ≤10% in all patients. Of note, serum creatinine was <200 μmol/L (2.3 mg/dl), and platelet count was <30,000/μl in all of them (10). None of them had congenital TTP. ADAMTS13 activity was measured in only 125 patients, and therefore, the diagnosis of TTP could have been missed in some patients. Nevertheless, 373 of 439 patients (85%) with measurement of ADAMTS13 activity did not have creatinine <200 μmol/L (2.27 mg/dl) and platelet <30,000/μl (10). aHUS was identified in 15 of 564 patients (3%; estimated incidence: 1.9 new patients per 1 million inhabitants per year). Complement alternative pathway abnormalities were detected in 11 of 15 patients (73%) with aHUS (genetic abnormalities related to factor H, hybrid CFH-CFHR1, or C3 in eight of 15 patients [53%]). Secondary TMAs were identified in 465 of 564 patients (94%) (Supplemental Figure 2). HUS Due to E. coli Shiga Toxin. HUS due to E. coli shiga toxin was identified in 35 of 564 patients (6%). Shiga toxin (using stool culture or PCR) was found in 34 of 35 patients (97%). The only patient without evidence of shiga toxin had a history of bloody diarrhea and consumption of fenugreek sprouts shortly before admission. The major cause of TMAs was pregnancy-related TMA (197 of 564 [35%; estimated incidence: 1% of pregnancies]), and HELLP was the most frequent cause of pregnancy-associated TMA (167 of 197; 85%) (Table 2). Only one of 197 patients (0.1%) with pregnant-associated TMA had evidence of complement alternative pathway abnormality (presence of antifactor H antibody). Infections were present in 184 of 564 patients (33%). The pathogen that caused the infection was identified in more than one half of the patients (Table 2). Fibrinogen was <1.60 g/L in three patients with E. coli infection with no shiga toxin (two in whom disseminated intravascular coagulation was suspected) and seven patients with other gram-negative infections (two in whom disseminated intravascular coagulation was suspected). Among bacteria, gram-negative bacteria were the most frequent cause. Infection with pneumococcus was confirmed in only five of 96 patients (5%), whereas infections due to Staphylococcus were present in 18 of 96 patients (19%). Among virus infections, cytomegalovirus and Epstein–Barr virus were the two most frequently found (cytomegalovirus and Epstein–Barr virus de novo infections represented 41% and 36%, respectively). HIV was present in 11 patients with TMA, but it was active in only two patients (Table 2). Drugs most frequently associated with TMA were calcineurin inhibitors and gemcitabine (Table 2). Malignancies were present in 105 of 564 patients (19%). Solid tumors represented one half of malignancies (mostly adenocarcinomas). Hematologic disorders were mostly acute leukemia, lymphoma, and myeloma (Table 2). Of note, fibrinogen <1.60 g/L was present in 21% of patients, and prothrombin time was <50% in 30% of patients. Among the 105 patients with malignancies, 64 patients (61%) were exposed to a drug that could trigger TMAs. Transplantation was present in 96 of 564 patients (17%; solid organ transplantation in 67 of 96 patients [70%]). All of them had calcineurin inhibitors. Autoimmune diseases were identified in 48 of 564 patients (9%). However, antinuclear antibody testing was only performed in 273 patients (and direct antiglobulin test was performed in only 51 patients). The most frequent causes were lupus, catastrophic antiphospholipid antibody syndrome, and systemic sclerosis (Table 2). Among patients with TMAs due to autoimmune diseases, antinuclear antibodies were part of the diagnostic workup in 88% of patients, and they were present in 76%. Coombs direct test was performed in 14% of patients and positive in 36% of them. Overall, 20 of 564 patients (4%) had features of malignant hypertension. However, five of 20 patients (25%) with malignant hypertension at presentation were classified as having aHUS, including three of 20 patients (15%) with complement alternative pathway abnormalities. Other secondary TMAs were found in 31 of 564 patients (5%). Patients with sickle cell disease (23% versus 2%; P<0.001), glucose-6-phosphate dehydrogenase (G6PD) deficiency (10% versus 0%; P<0.001), and folate deficiency (44% versus 22%; P=0.02) were more frequent in this group than in the group of primary/secondary TMAs (Table 2). The cause of admission was usually anemia associated with vaso-occlusive crisis in patients with sickle cell disease. One half of patients with TMAs had more than one additional cause or precipitating factor (Supplemental Table 1). Combined causes were observed more frequently in secondary than primary TMAs (57% versus 19%; P<0.001). They were mostly present in TMAs associated with transplantations, drugs, malignancies, infections, and autoimmune diseases (all P<0.001 versus other patients) (Supplemental Table 1). Red cell transfusion was administered in 41% of patients (Table 3). Plasma infusions or plasma exchanges were used in 16% of patients (Table 3). Plasma infusions or plasma exchanges were used virtually in all patients (17 of 18 [94%]) with TTP. Of note, plasma exchange was not used in two patients (one in whom TTP was not diagnosed and one patient with concomitant leukemia at a terminal phase). Eculizumab was used in ten of 15 patients (67%) with aHUS (Table 3). Of note, since 2012, only one patient with aHUS was not treated with eculizumab: she started maintenance dialysis, and the diagnosis of factor H mutation was made several months after the disease onset. Among pregnant women with TMA, only 6% had plasma exchange or plasma infusion. Management included antihypertensive medications and prompt delivery in most of them. The rate of major complications or death was 181 of 564 patients (32%; major cardiovascular events: 20%; dialysis: 15%; neurologic events: 4%; and death: 10%) (Table 4). The figures are 16%, 15%, 5%, and 17%, respectively, when patients with primary TMAs, HUS due to E. coli shiga toxin, and pregnancy-related TMAs are excluded. Of note, patients who were given platelet transfusions had a higher crude risk of death (versus patients who did not receive platelet transfusions; odds ratio, 4.22; 95% confidence interval, 2.36 to 7.60; P<0.001). The risk of major cardiovascular events was greater in patients with infections and lower in patients with TMA associated with pregnancy or transplantation (Table 4). The risk of dialysis was greater for HUS due to E. coli shiga toxin and infections and lower in malignancies and pregnancy-related TMAs. TTP and infection were risk factors for neurologic complications (Table 4). Patients with TTP, infection, malignancy, and other TMAs had the highest risk of death (Table 4). The analysis of this large cohort of consecutive patients with adjudicated TMA provides several results that help refine the clinical picture of TMA. First, aHUS, TTP, and HUS due to E. coli shiga toxin, the three types of TMAs that have had the highest number of studies performed, represent altogether <10% of TMAs in adults. Importantly, the evaluation of the relative contributions of primary and secondary is highly dependent on the selection of patients. The Oklahoma TTP-HUS cohort only included patients who were treated by plasma exchange (11); in this study, 31.7% had “idiopathic” TMAs. In the study of Kang et al. 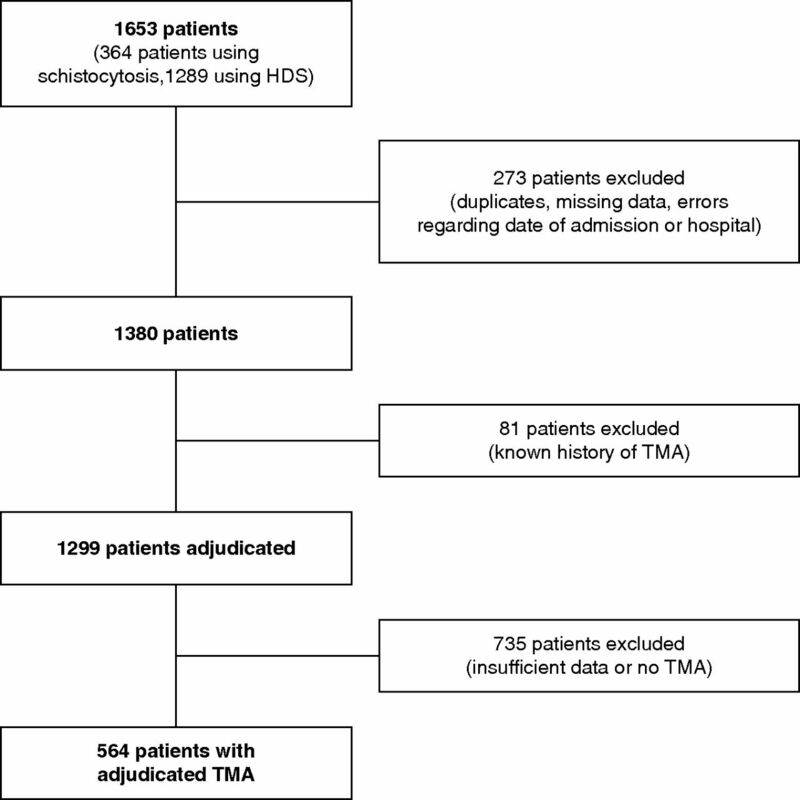 (12), 117 patients with unadjudicated TMA were included on the basis of the presence of schistocytosis and elevated LDH or kidney TMAs; in this study, 13.8% patients had TTP, HUS due to E. coli shiga toxin, or aHUS (11). In a recent study on the basis of plasma samples from patients with thrombocytopenia sent to a national reference laboratory for ADAMTS13 assay, aHUS (11.5%), TTP (38.0%), and HUS due to E. coli shiga toxin (3.5%) represented the majority of patients with TMAs (13). In marked contrast, our study included all consecutive patients with TMA, and the patients were adjudicated. Of note, our estimated incidence of TTP is in accordance with data from other centers (14,15). The majority of the patients presented with secondary TMAs. Pregnancy-associated TMA was the most frequent cause of TMA, and most of these patients had HELLP. Lower figures were reported in another study, but the authors did not include cohorts of consecutive patients (16). The other main cause of secondary TMA was infections, including those from a wide range of bacteria, viruses, and parasites (17,18). Malignancies represented other frequent TMA causes, and the majority of patients with malignancy-associated TMA had adenocarcinoma, leukemia, or lymphomas, in line with previous reports (19,20). Adenocarcinoma cells produce mucin, and mucin could affect vWf production (7,18,19). A toxic role of metastatic microemboli for microvessels is also possible (21). Second, one half of patients had more than one cause or precipitating factor of TMAs, and combined causes or triggers were mostly infections, drugs, malignancies, and medications. This was particularly true in patients with transplants (22–25). Our data thus underline the high frequency of multiple triggers or causes in patients with TMAs and support the view that “multiple hits” may be necessary to trigger the disease, especially in secondary TMAs. Third, extensive diagnostic workup was performed only in a minority of patients, despite published recommendations (3,26): management of these patients was probably not optimal as expected in real-life clinical setting. Misclassification is possible in some patients, because the diagnosis workup was not always extensive. Our study highlights the need for more systematic diagnosis workup in patients with a suspicion of TMA. The diagnostic workup is a complex step-by-step process to rule in or out the distinct types of TMAs. Careful extensive workup of TMA is mandatory in patients with TMAs, and it probably requires the education of clinicians and interdisciplinary approaches, including the creation of “TMA teams” (4). In patients with secondary TMAs but none of the classic causes, we observed significantly higher incidence rates of sickle cell disease, G6PD, and folate deficiency than in the other patients. Whether these conditions play a major role in TMAs is presently unknown, but sickle cell disease and G6PD deficiency were recently associated with TMAs (27,28). The mechanism is not fully understood (27–29). The importance of rapid diagnosis is highlighted by our finding that significant morbidity and mortality are associated with distinct types of TMAs. Nonoptimal management may have contributed to these deleterious outcomes. Of note, a minority of patients with TTP needed acute dialysis during hospitalization in line with reports (30,31). Our study has limitations. Selection bias seems unlikely, because we included 564 consecutive patients. The true prevalence of pregnancy-related TMAs may be overestimated, because our university hospitals receive women with high-risk pregnancies. It is a real-life study: diagnostic tests were not performed in all patients, and management was probably heterogeneous. Some patients with TMA may have been missed because of insufficient data or a too stringent definition of TMA. It can argued that TMA is a pathologic diagnosis, and biopsies were not performed. However, they are usually not performed on patients with TMAs and low platelet counts. The strength of this study derives from the careful review of all individual files in contrast to other reports using databases (23,24). The diagnosis of TMA was adjudicated by three physicians familiar with the disease. In conclusion, this study constitutes one of the first large-scale clinical pictures of TMAs and gives a clear estimation of the frequency and incidence of distinct types of TMAs. Our findings highlight the need for a more extensive study of secondary TMAs, which are, by far, the most frequent forms of TMAs. F.F. reports personal fees and nonfinancial support from Alexion, personal fees and nonfinancial support from Roche, and personal fees from Achillion outside the submitted work. J.-M.H. reports personal fees and nonfinancial support from Alexion and personal fees from Ablynx not related to the submitted work. G.B., F.v.T, B.T., A.B., C.B., S.C., E.M., S.L., D.G., L.B., E.G., F.P., C.P., F.M., P.G., B.S., E.R., M.B., and C.V. have nothing to disclose. This article contains the following supplemental material online at http://cjasn.asnjournals.org/lookup/suppl/doi:10.2215/CJN.11470918/-/DCSupplemental. Supplemental Figure 1. Admission of patients with TMAs to medical and surgical units. Supplemental Figure 2. Incidence of primary and secondary TMAs. Supplemental Table 1. Combined causes or precipitating factors (such as infections, transplantations, drugs, and malignancies) in TMA.